I’m (Krista) waiting for some new acquaintances (cross-cultural workers) to arrive at the restaurant and am enjoying a moment to sit and watch the lull of the city go by in front of me through large metal-framed windows. 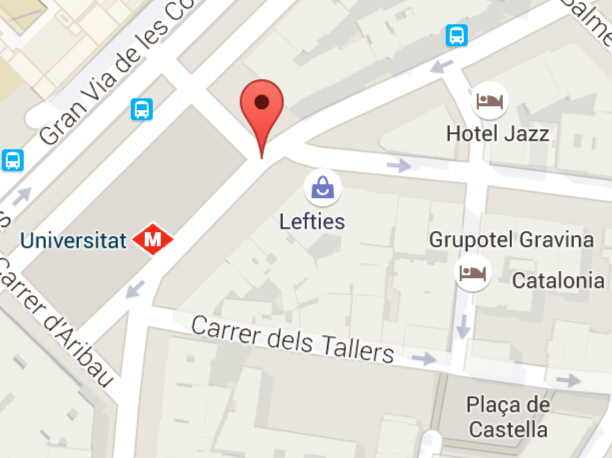 The only thing atypical about this is that I’m sitting here off of the Plaza Universitat in downtown Barcelona. 1) Edu and I have been appointed “Intern Coordinators” by our team in Spain and we love getting to serve in this area. I met our Summer intern at the airport in Madrid, traveled with her to her ministry location (Jaén), and helped her get off on the right foot with a few days of orientation. We’ve had a great time together to say the least. We spent a relatively short amount of time together but had some belly-cramping laughs, honest conversations, and got to enjoy the Lord’s goodness together. She recently told me that she will find it hard to say goodbye. I also got to enjoy my teammate’s hospitality and loved getting to stay with them. Thanks Joel and Vivian! 2) Enter Spain for residency purposes. I have permanent residency in the E.U. but I’m not really supposed to be out of Spain for longer than six months max. So, this was a good chance to come in and comply with that requirement. 3) Ministry visits… I was able to take advantage of my proximity to Granada and had a great ministry meeting regarding a discipleship program. It was one of those meetings that gets you so excited your heart beats faster and you leave knowing you’re on the right ministry path. Rest assured, you’ll hear us talk more about this discipleship program in the future. The day after visiting Granada, I picked up a rental car and drove three hours south to the coastal city of Málaga. I met an amazing family from a local church (Iglesia Cristiana Evangélica Añoreta) to hear about ministry and church planting in the area. As I was leaving our meeting, I asked for directions to the mall to get something to eat for lunch. They told me how to get there and then asked why I was going. I explained that I had a few hours to kill before I needed to be at the airport (see next story) and they invited me to eat with them. Considering I had only met them a few hours before, I thought this was incredibly generous. We picked up their kiddos from school and instead of going to their house, they invited me to eat fresh fish at a small well-known local seafood place on the beach. It was an unexpected blessing to get to sit next to the ocean and enjoy a meal together. I flew to Barcelona from Málaga (1.5 hours) that evening and cried when I came through the arrival doors at the airport and saw friends from our church in Vilassar de Mar. It has been six months since we left, and it felt like I was immediately surrounded by family when I saw them. The Catalan came back surprisingly well but I wouldn’t say I’m a pro. People appreciate the effort, so I am glad to try and make one ; ) I attended a small group/prayer meeting on the Wednesday evening I was there and was able to visit with many brothers and sisters from the church. In nine days I have stayed in four different homes, saw three airports, and travelled by bus, train, plane, and rental car. It has been an intense trip that has served to connect with missionaries, teammates, and other ministry leaders in Spain. As I traveled about the country, seeing different ministries and connecting with people along the way, it was very reassuring to see that Spain is where we need to be. We hope to return around the beginning of 2016. Please be praying for our finances here in the U.S. Pray that we would be wise and good stewards of what the Lord has given us. While living in Spain, certain expenses were quite small compared to the U.S. (insurance and car costs for example). Along with this, please praise the Lord for small jobs here and there where we can work in our spare time to make ends meet. Please continue to pray about our decision as to where we will be serving in Spain when we return. We have had many encouraging conversations recently and hope we are close to a decision. Please pray for opportunities to share about why we’re compelled to serve in Spain and invite others to be a part of what the Lord is doing there.